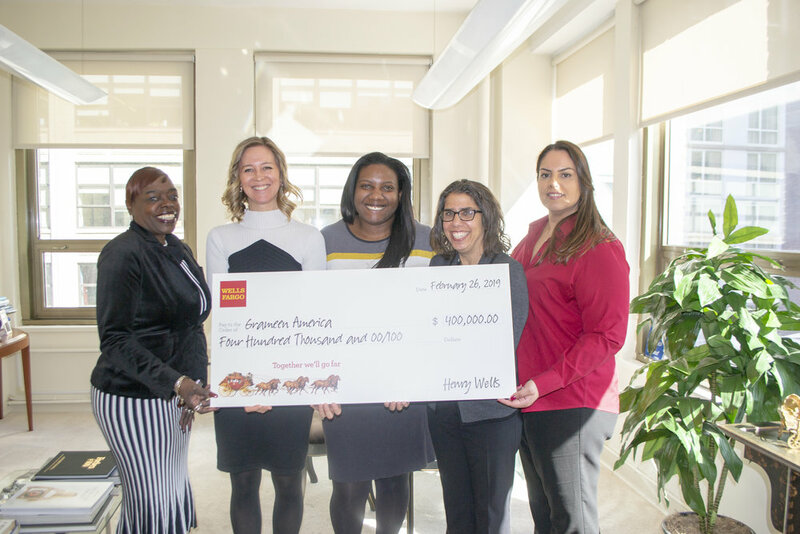 New York, NY, March 18, 2019—Wells Fargo & Company (NYSE: WFC) announced New York-based Grameen America was awarded $400,000 in grant funds and $7.5 million in lending capital through the Wells Fargo Works for Small Business: Diverse Community Capital program. The Diverse Community Capital program awards lending capital and grants to Community Development Financial Institutions (CDFIs), like Grameen America, which in turn deliver responsible, affordable financial products to diverse small business owners who do not typically have access to conventional financing. Wells Fargo has now exceeded its initial $75 million commitment for the Diverse Community Capital program, and an additional $100 million from the Wells Fargo Foundation has already been pledged to continue the program at least into 2020. With the latest round of funding, Wells Fargo reaffirmed its commitment to CDFIs serving urban centers, like New York, recognizing the importance of supporting diverse small businesses in the nation’s largest cities. The grant will support Grameen America’s growth in Harlem, New York, and Newark, New Jersey, enabling the organization to reach a diverse population of low-income women entrepreneurs with their microloan, and asset- and credit-building programs. In Harlem, the funds will enhance program operations and oversight, staff training and expansion, and technical support. They anticipate reaching over 1,700 African-American women entrepreneurs by the end of 2020 with $9 million in microloans. In Newark, the funds will help Grameen America’s young branch there, allowing the organization to expand its staff and programs to reach the city’s diverse communities. Their goal is to reach over 2,500 low-income women entrepreneurs in Newark by the end of 2020 with over $14 million in microloans. Across the country, Diverse Community Capital awardees have closed more than $391 million through more than 8,000 loans to diverse small business clients. Diverse small businesses that received loans from awardee CDFIs have retained more than 21,000 jobs and created more than 15,000 jobs as a result of accessing the capital and development services they needed. Founded by Nobel Peace Prize laureate Muhammad Yunus, Grameen America is a 501(c)(3) nonprofit microfinance organization dedicated to helping entrepreneurial women who live in poverty build small businesses to enable financial mobility. The organization offers microloans, training, and support to transform communities and fight poverty in the United States. Since opening in January 2008, Grameen America has invested over $1 billion in more than 110,000 low-income women entrepreneurs. Started in Jackson Heights, Queens, Grameen America has expanded to 21 locations in New York City, NY, Austin, TX, Boston, MA, Charlotte, NC, Indianapolis, IN, Los Angeles, CA, Newark, NJ, Omaha, NE, Oakland, CA, San Jose, CA, San Juan, PR, Union City, NJ, Miami, FL, and Houston, TX. Learn more at www.grameenamerica.org.